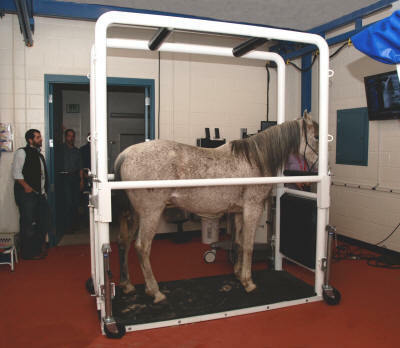 Stocks are a safe containment area for your horse, facilitating therapy, palpation, cleaning and dressing wounds, massage, and nebulizing, just to name a few. Weight - app. 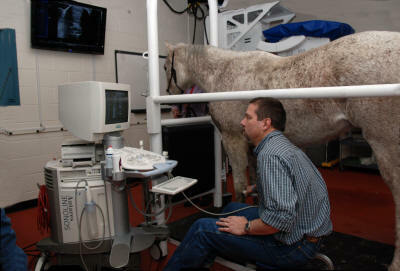 1,000 lbs. 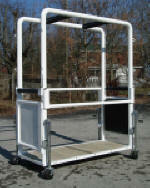 The Portable Stocks are useful in locations that cannot be permanent. 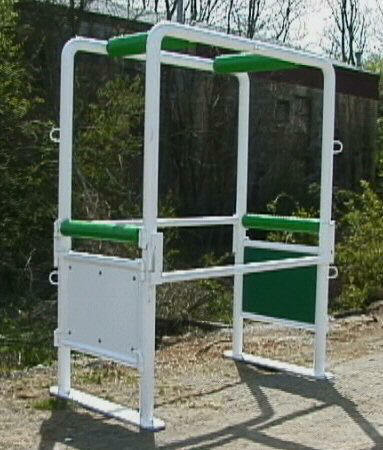 The horse stand on the floor, which is lowered to the ground when in use. 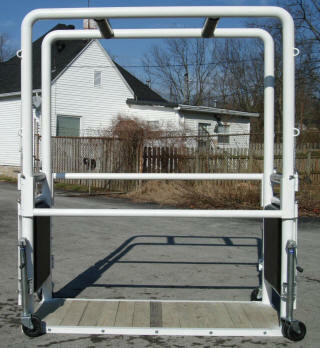 When not in use, the stocks can be jacked up onto the double wheels in each corner and easily pushed to another location. 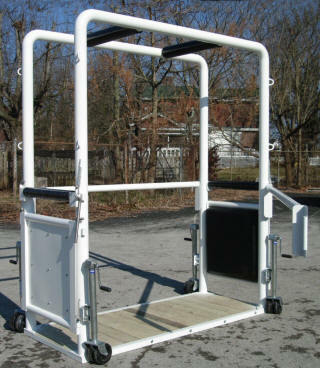 Like our permanent location stocks, (shown lower on this page) the Portable Stocks will open on any end, from each side and both side rails can be flipped for shorter horses or lowered out of the way for therapy or diagnostics or completely removed for ultrasounds, MRI’s, x-rays or any other medical procedure. 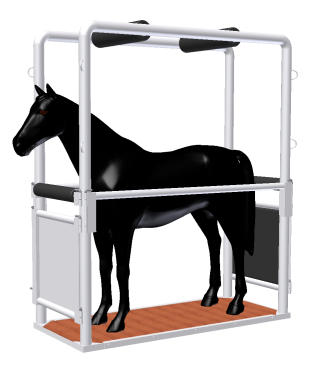 Ease of use; horses load easily from the side. 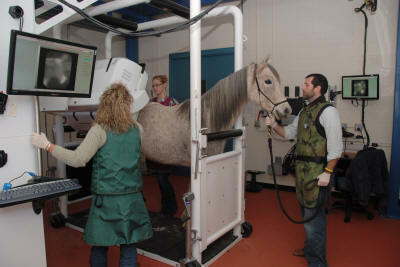 the horse when using a Scintigraphy camera. 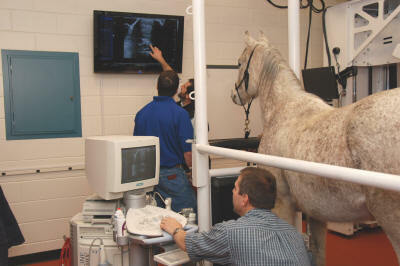 Teaching horse to read his own results ... priceless! 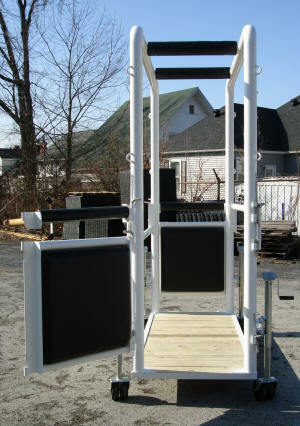 EquiGym’s Standard stocks are built with floor anchor bars between the front and between the rear legs. 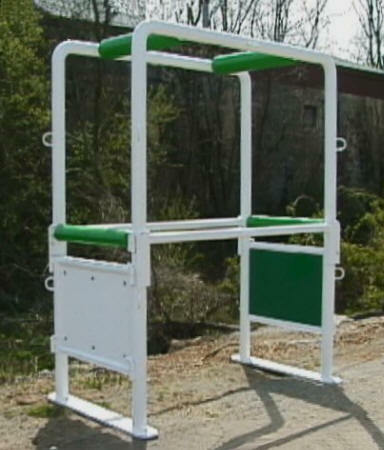 The stocks can also be built so that each leg is concreted into the ground. 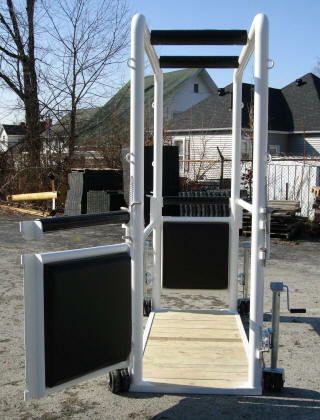 EquiGym can design custom stocks for most needs. 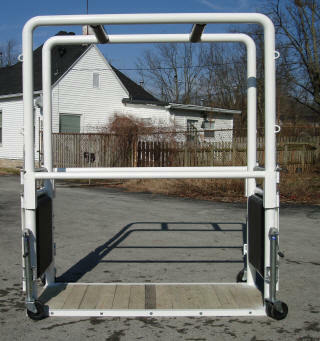 Optional: Padded Quick Clamp Bar that will keep the horses either forward against the front bar or backwards against the rear bar of the Stocks.